Golden Apples: I have thumbs! 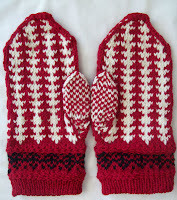 And completed mittens (all the finishing work is done too). 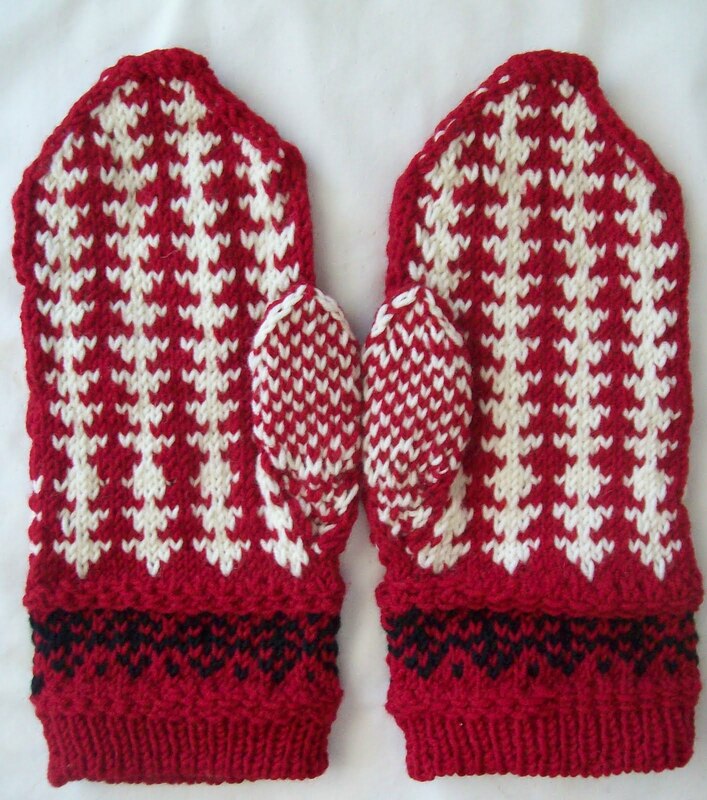 These mittens are prettier—and were made in 1/3rd the time. And I have more of the Lion Brand Hometown USA yarn—some for me, some to share—all of it courtesy of Lion Brand itself. I've completed my second square—no overt message on this one. But it is green and has a green message. 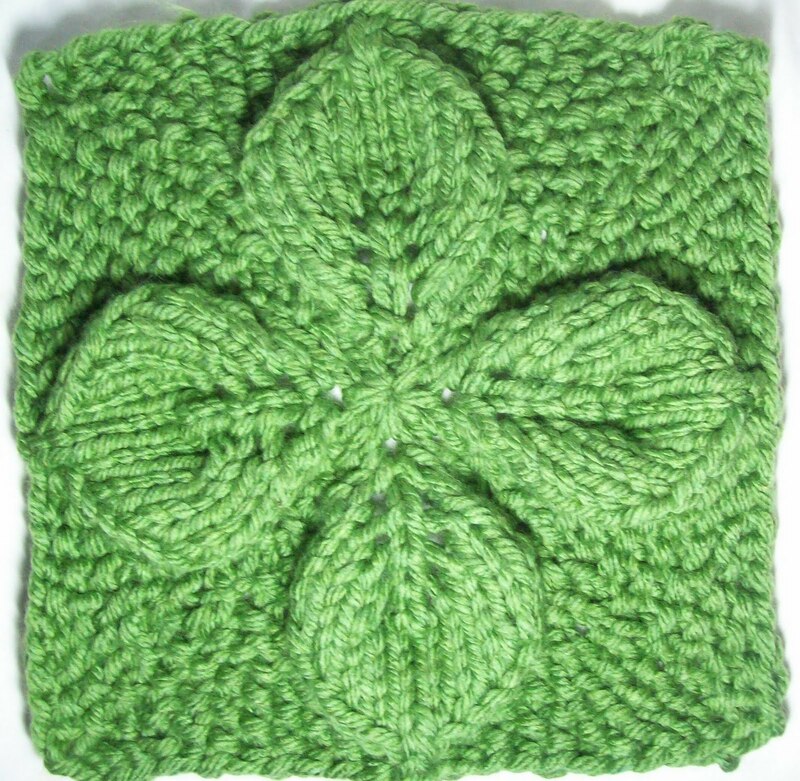 I worked from the center out—with 4 raised leaves—each pointing to the ordinal points (North South East and West)--and between the leaves, seed stitches. 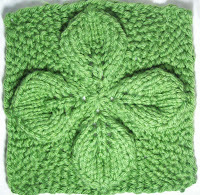 It carries a message of growth and renewal, of treasuring the green earth. The raised leaf motif is a traditional pattern—one that was a classic design for counterpanes--and while this isn't the whole pattern--its is close. (I think the color (not labeled) is Oklahoma green. Some of the other skeins are going to friends—so they too can knit a message to the universe. These squares will be joined into a huge scarf to cover the early rockets (Titan and Mercury) that were part of the USA (NASA) space exploration. The Rockets have been a feature of the Flushing Meadow Park since the 1964 World's Fair. After the fair, they will be re-assembled into 4 X 6 blocks and made into blankets for Warm Up America. 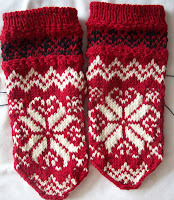 There will be a knit night one day (or will it be different days) next week in NYC—I'll post details as soon as I get them—here and on Ravelry. but Lion Brand Yarns, and the zip (available on the ball wrapper) work too. We are a big city—but Lion Brand is a big company! I know today is an anniversary (and the weather is the same clear blue sky kind of day) but I am not going to do much to mark it. Here is a back link to a previous post. Hi, this is Jess from Lion Brand. We really appreciate your help making this project a success. However, blocks should not be mailed to our offices. Instead, they should be returned back to Robyn so that all of the blocks are collected together. Thanks again!